CLICK HERE TO SUBSCRIBE TO THE MAXIMUM EDUCATION EMAIL LIST TO GET ONGOING INFORMATION, TEST TAKING TIPS, INFORMATION MANAGEMENT TIPS, STUDY SKILLS TIPS AND YOUR COMPREHENSIVE STUDY PLAN. Interested in boosting your grades? Making your work load easier? Accomplishing more school work in less time? Are you finding it difficult to stay focused and motivated during and after classes? Are there topics or activities related to school that you find frustrating to do and difficult to understand while other students make it seem like it is a breeze? School is Challenging Enough – Make it Easier. Students are often overloaded with a wide range of subjects, tests, quizzes and papers and other projects, with different types of assignments, with different teachers with different teaching styles, books to read, websites to log on, grading rubrics to be aware of, classrooms and class schedules, not to mention all of the out of school commitment. Students today are overloaded with school work load, extracurricular commitments, sports, volunteer work and more. They struggle to reach their academic potential and often become frustrated with the process. Here is the solution… Maximum Education provides a blueprint for success for students by providing functional tools for time management and prioritization, class note taking, outlines to organize information, test preparation skills and specialized tips for test preparation, standardized tests, college admissions test (ACT, SAT) and term papers. This workbook also offers access to the mAke the grAde community of learners – an interactive group coordinated by Dr Greene – which allows students to share ideas, ask questions, and collaborate. There is a reason – They have a system! In 20+ years of tutoring and education, Dr Greene has worked with and helped more than 8 000 students and their families. He has seen year after year, that MANY students underachieve or have poor academic performance simply because they do not have a system. Con sequently, they hand in homework assignments late or incomplete if at all, or they do not fully understand the subject matter being taught during class and they get low or failing test grades. They become frustrated and discouraged. Even worse, because of their lack of understanding, and they do not raise their hand in class because they are embarrassed that they might have the wrong answers because they did not have organized notes. This is why Dr Greene wrote Maximum Education — To give YOU the tools that you need NOW to help you succeed at all levels of your education. Time management and information management systems. Learn to manage your time for the short and long term. Information management: note taking, outlining, calendaring, test prep and more. Dr Steven Greene is a lifelong educator. In 1996 he founded mAke the grAde, a full time and full service tutoring and educational support company. Dr Greene holds a teaching certificate in Comprehensive Science. Since its inception mAke the grAde has worked with over 8 000 students and their families to “help them to reach their goals”. mAke the grAde specializes in test prep for the important SAT/PSAT and ACT college admissions exams, academic support for all levels of Science (Biology, Chemistry, Physics, etc) and Mathematics (Calculus, Pre-calculus, Algebra 1 and 2, Geometry, etc). 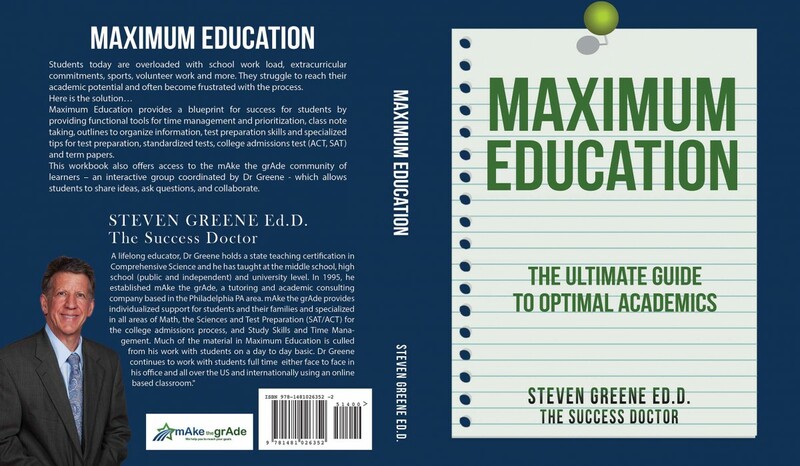 In 2015 Dr Greene published ‘Maximum Education’ which provides a straightforward system for students at all levels to manage their time, their information, and to create a comprehensive study plan. The book quickly became a #1 Best Seller on Amazon and continues to sell steadily. Shortly after the release of the book, Dr Greene introduced a series of live and internet based workshops based on the principles in Maximum Education. Dr Greene continues to teach and tutor full time. He meets with students in his office in the Philadelphia PA USA area as well as working with students all over the world using an internet based classroom. Maximum Education Blog at WordPress.com.